Three self-proclaimed #digcit nerds come together to share what they’ve learned from their work with educators, students and preservice teachers. Participants will think critically about their current delivery of digital citizenship instruction and consider how that instruction might evolve to effectively impact students. Innovative lessons for K-12 classrooms will also be shared. 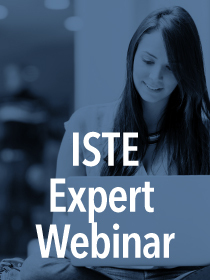 This ISTE Expert Webinar is presented by Nancy Watson, LeeAnn Lindsey and Kristen Mattson of the ISTE Digital Citizenship Network.